FLAGSTAFF, Ariz. (AP) — Lawmakers on the Navajo Nation have given the OK for a team to negotiate a $20 million loan to acquire three new planes, raising questions among tribal members about the priorities on the vast reservation where half the workforce is unemployed and thousands live without running water and electricity. The tribe has three Beechcraft King Air turboprop planes that have taken tribal officials to meetings in Flagstaff, Phoenix and Salt Lake City, to the nation’s capital for President Barack Obama’s inauguration and to Colorado to assess a mine spill. The sponsor of the loan package, Davis Filfred, said the planes put into service in the late 1980s and early 1990s will be grounded next year because it’s too costly to keep overhauling their engines and other parts are badly worn. He said the planes are essential for doing business, particularly when the reservation has no commercial air service and driving to meetings can take hours. Some of his colleagues on the Navajo Nation Council disagreed, arguing the deal sends the wrong message. Filfred’s bill awaits action by President Russell Begaye, who has said he will veto it if it affects direct services to Navajo people. Air transportation rarely, if ever, is mentioned as a dire need for ordinary Navajos. Begaye and the Tribal Council agreed earlier this year to focus on nine, wide-ranging issues that include infrastructure, water rights, education, housing and the economy. Filfred said the planes provide a means to lobby for funding for the country’s largest American Indian reservation. According to the flight-tracking website flightaware.com, the three tribal planes have flown more than 400 times this year alone. Priority is given to the president, vice president and council speaker, but they’re available for use by any tribal agency. A spokesman for Begaye did not respond to requests for annual air transportation budgets, frequency of flights, passenger lists and destinations. Tribal Council spokesman Jared Touchin said the legislative branch does not keep detailed information on air travel. The Judicial Branch used a tribal plane once in the last fiscal year, spokeswoman Karen Francis said. A round-trip flight from tribal headquarters to Phoenix is about $1,400, while the trips tribal leaders made to Washington for Obama’s inaugurations in 2008 and 2012 cost about $14,000 each. Joe Berardesco, a pilot who oversees the tribe’s Air Transportation Department, declined an interview request from The Associated Press. He said in legislative sessions that the tribe would trade in the existing aircraft and spend $20 million for the purchase of new aircraft — possibly jets — along with training and maintenance. “With a new fleet of aircraft, you guys will be set for another 35 years,” he said. 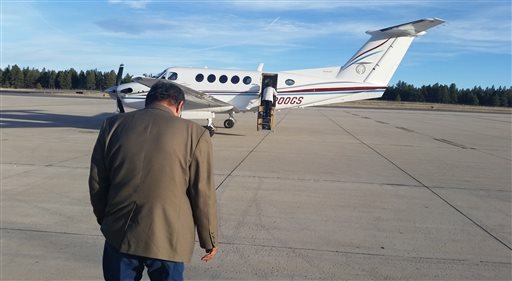 In a letter published in the Navajo Times, tribal pilot Adriel Heisey wrote that the turboprop planes could be replaced with newer ones, but corporate jets are another option and could take tribal leaders to Washington, D.C., nonstop in under four hours. Depending on what the tribe actually buys, the aircraft could have trouble taking off from some of the tribe’s runways. In Tuba City, a hump in the pavement limits planes to mostly the southern end of the runway. The Window Rock airport cannot be expanded in its current location. Residents also have complained about noise from planes, airports manager Arlando Teller said. It’s not uncommon for governors and state lawmakers to use government aircraft for official business. Government officials in Utah can rent travel time per hour on any of three small planes. New Mexico maintains a 2006 Beechcraft King Air turboprop plane for the governor and lawmakers. Arizona has a fleet of 13 turboprop planes, which it plans to reduce to 10. Navajos have mixed feelings about spending $20 million on planes. Some cited what they said were more pressing needs on the reservation and suggested tribal officials could drive to their destinations or to commercial airports. Lorinda Ben of Nazlini said Navajos struggle daily with having to travel long distances on rough roads, most of which are unpaved on the reservation. Electricity and running water can be considered luxuries among tribal members. Associated Press writers Bob Christie in Phoenix and Michelle Price in Salt Lake City contributed to this report. This story has been corrected to fix typo in name of pilot, Adriel Heisey.